The Danish government said today that it wants to allow gas stations, clothing stores, and restaurants the option to stop taking cash payments, a move that could accelerate a huge shift toward credit, debit, and alternative payment systems. The measure is part of a larger set of 50 proposals (in Danish) from Denmark’s ministry of finance that aim to make it easier to do business in the country and boost economic growth. Currently, Danish companies are required to accept cash payments, which “involve considerable administrative and financial burdens,” the finance minister, Bjarne Corydon, said. For instance, he said retailers spend a fair amount of resources on security guards and surveillance systems, as well as spending the time to make change for customers. Grocery stores, dentists, doctors, post offices, hospitals, and nursing homes are among the establishments that would be excluded from the proposed rule. If the change is implemented, it could mean that retailers, restaurants and gas stations would be able to turn away customers who don’t have access to electronic payments as early as Jan. 2016. The idea is that transaction costs, as well as crime, go down when physical currency is eliminated. According to a study by McKinsey, electronic payments make banking systems more productive and lessen the need for an informal or shadow economy, which isn’t taxed nor monitored by the government. Plus, consumers in many countries are already rapidly moving toward mobile and other electronic payments. In Denmark, where virtually all adults now hold at least one payment card, three out of four Danes used debit cards for online purchases last year, according to a report by the Danish Payment Council. Cash and checks made up just about a quarter of retail payments in 2014, down from 80% in 1990, the council said. 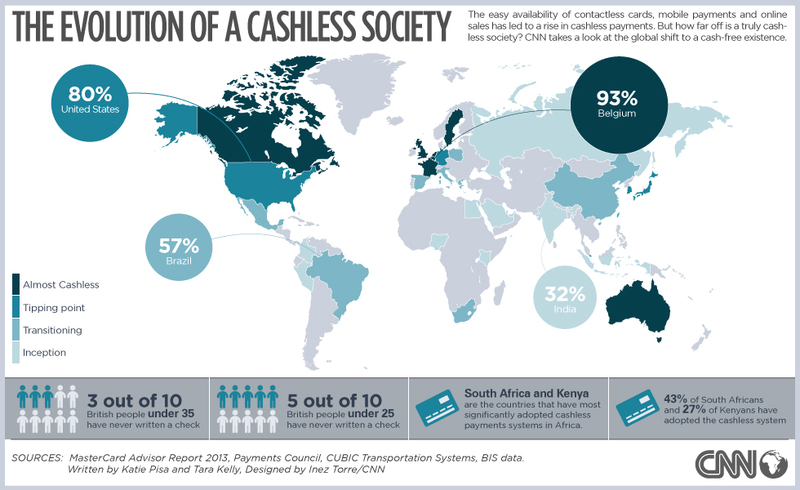 The plan to eliminate cash payments from retailers and restaurants will no doubt raise concerns over possible restrictions of consumer access to necessary goods such as food and gas, as well as to risks of increased electronic fraud, but Denmark and other Nordic countries have already signaled they intend to lead the shift toward cashless economies, even if they have to push consumers along with them.